Call or Email us for your free quote today. Blog Sculptures From Scrap Metal? You Have To See To Believe! Sculptures From Scrap Metal? You Have To See To Believe! Here at Gardner Metals, we appreciate scrap metal in all its forms. That’s precisely why we were so thrilled to discover that enterprising artists have been using it to create some pretty fantastical works of art. From steampunk bison to real-life transformers, scrap metal artists are building larger-than-life sculptures and giving new meaning to the phrase “one man’s trash is another man’s treasure.” Even the elusive Voice of a Generation likes to pick up the welding tools every now and then, creating elaborate gates and mounted structures made completely from old heaps of junk. If that’s not enough to get the creative juices flowing, we’ve picked out some of our favorite fanciful scrap metal pieces. These sculptures are so imposing and so stunning that they may just make you think twice about the potential Picassos lying around your local scrap yard! This bronco buster, caught mid-action, stands in a field outside Lemmon, South Dakota, in the northwestern edge of the state. Lopez has built similar western-themed sculptures all over the Mount Rushmore State, all made from discarded farm equipment. Hailed as the largest scrap metal sculpture in the world by the Guinness Book of World Records, this monstrous-yet-graceful sculpture stands along the North Dakota section of Interstate 94, a 32-mile stretch of road known colloquially as The Enchanted Highway. Greff, a retired schoolteacher, built this sculpture and several others like it to draw curious tourists traveling on I-94. 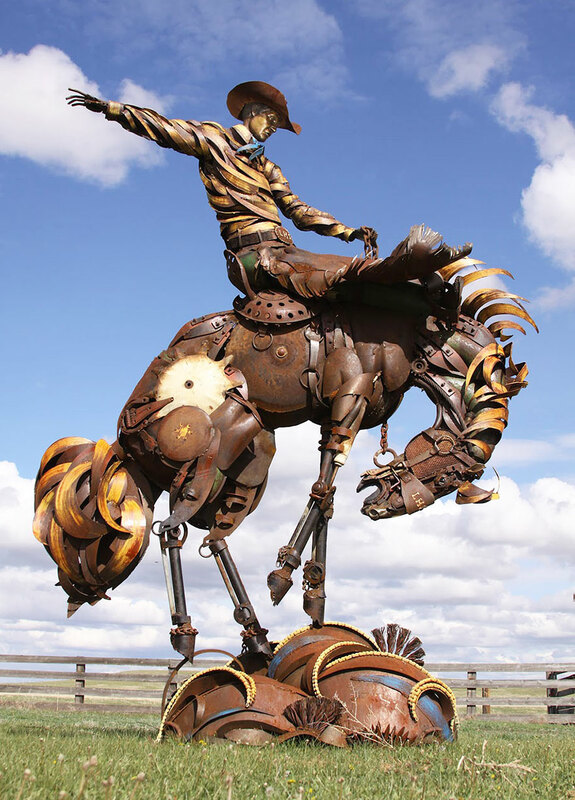 The pieces depict a grasshopper, a stagecoach, a pair of pheasants and other emblematic symbols of the American prairie, all built from 100% recycled scrap metal. There must be something about the midwest that inspires greatness—at least when it comes to metal sculptures. Forevertron is located in a sprawling, wondrous sculpture garden located in Sauk County, Wisconsin. The piece was created by retired scrap metal salvage expert, Tom Every, better known as his doppleganger, Dr. Evermor. Every has created a backstory for Dr. Evermor that’s as whimsical as his sculpture world; you can read the whole thing on Atlas Obscura. The highlight of the huge park is the so-called Bird Band, a collection of 70 or so fantastical bird sculptures—some of which actually play music! You wouldn’t want to see this guy hanging off the Empire State Building! Made of recycled car and motorcycle parts, this piece took Tom and his team of welders almost 400 hours to build. All pieces are polished and coated with an anti-rust lacquer to keep them shiny and bright. We doubt even King Kong himself would want to tangle with this guy! Not every scrap metal piece has to be massive, as demonstrated by these minute little beauties from Welsh artist John Kennedy Brown. Brown spends hours painstakingly fashioning recycled scrap metal into realistic works of art and painting it in eye-capturing colors. You can browse all of his works on his Etsy shop, Green Hand Sculpture. And with that, we’ll have to bid you a fond farewell. These pieces have got us so inspired, we just may have to walk out to the scrap yard and see what kind of artistic implements we have just lying around. 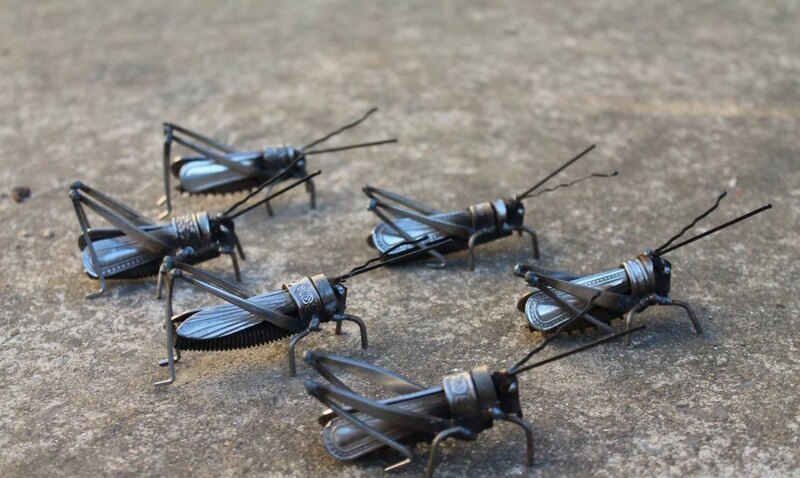 Want to start making your own scrap metal sculptures? Visit your local scrap metal yard today! Contact us for a free pricing quote today and we’ll get back to you within 1 business day.